Primary data acquisition is the front end of mapping, GIS and remote sensing and involves: aviation, navigation, photography, cameras (film and digital systems), GPS systems, surveying (ground control), photogrammetry and computerized systems. 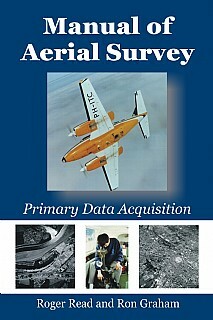 This book deals with differential GPS systems, survey flight management systems (both simple and sophisticated), film types, modern film survey cameras such as LH RC-30, Z/I RMK-TOP, digital cameras, infrared methods, laser profilers, airborne laser mapping, satellite systems, laboratory processing (chemical and digital), camera platforms (fixed wing and helicopter). A fresh approach to the subject includes: soft-copy photogrammetry using desk-top computerized systems, film scanners and direct digital camera inputs. Comparisons are made between old film-based technologies and the new digital camera systems, including the Z/I modular digital mapping camera and the LH 'push-broom' ADS 40 camera. The Manual of Aerial Survey still provides valuable information for survey operators, aerial photographers, photogrammetrists, surveyors, cartographers and mapping scientists, GIS specialists and the new generation of 'desk-top' mapmakers. It will continue to be a useful reference for survey practitioners, civil engineers and planners, flight crews, and academics and students in surveying, photogrammetry, remote sensing, GIS and earth sciences.